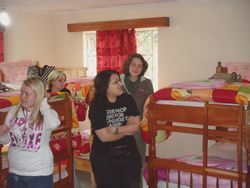 Volunteers in Nairobi stay at a hostel type accommodation or home stay accommodation. 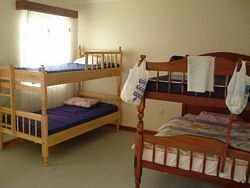 You will share a room with a number of other volunteers of the same gender and will sleep in bunk beds. Couples are provided a separate room. You will share a flushing toilet and bathroom with a shower with other volunteers. There is running water in the house. As with the running water, there is electricity, but this will not be as reliable as it is at home in the West (A good reason to bring a decent torch!). Black-outs are common, and it is not unusual to go without power for a few hours at a time. You will need to do all your own laundry (by hand), as well as cleaning your room and helping with cleaning of the common areas and kitchen. Volunteers in one of the boys room. Volunteers in one of the girls room. Volunteers room at the volunteer house Nairobi. Volunteers play a game of football inside the compound in Nairobi. 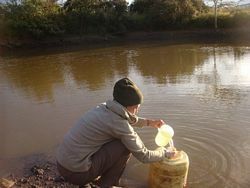 Volunteer house in Nairobi has modern facilities including flush toilets and hot showers. Volunteers house in Nairobi has adequate storage cupboards. 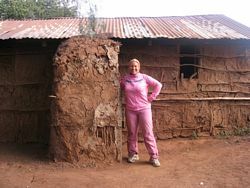 Living conditions on the Kenya Maasai volunteer program are basic. 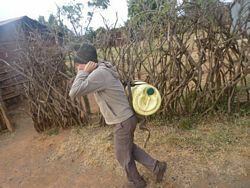 Masai home stays having no running water or electricity. The areas tend to be very dry but scenic. Maureen helps slaughter a goat at a Masai volunteer home stay. 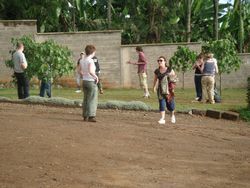 Volunteer Kenya Accommodation: Vesna - Philadelphia, PA; USA.